Today I’ll be writing about avalanches and mountain safety. I’ve already gone through this topic in different posts and the truth is that there is great literature on the topic out there. Actually, last spring I wrote a pretty detailed article with Lauegi, the avalanche patrol of the Val d’Aran and one of the most reputed in Europe. However, this week I am going to do it on a different tone, way more practical and graphic. Last sunday was one of those spectacular days of sun, dry cold powder in between thirty centimeters and up to over a meter, hundred kilometers of slopes open with all it’s easy access freeride sectors and a big hunger of powder after a long summer. It definitely was a glorious day of riding and we have enough gopro videos as to fill instagram until christmas. Just as us, there were many groups of riders out there and all the mountains ended up tracked to the bone. However, there were as well many grey lights. 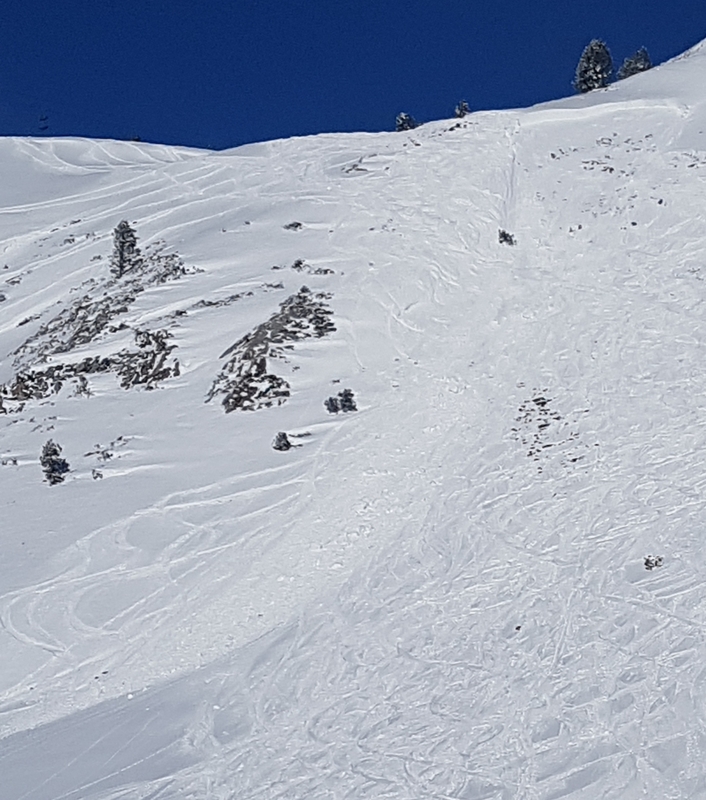 We witnessed four avalanche situations that could have ended up very poorly and spotted several other sketchy scars on the mountain, most of them over ski tracks and just a few meters away from the ski slopes and lifts. Well, avalanches are out there, closer than you may think and people just like you can get trapped on them and even die. In fact, this can happen in that slope that you’ve seen skied so many times and that perhaps you may have skied yourself. I’m hoping that through practical cases, this article will achieve to raise your awareness and protocols in avalanche safety. Unfortunately we tend to learn through pain, so even though last christmas we got an avalanche transceiver, an airbag, it may say recco in our ski boot and we’ve read something here and there, it doesn’t mean at all that we are safe out there. Well I hope to get the spook in your spine and build some constructive feedback out of it. “Several unstable wind slabs and snow slabs have appeared, with the ability of been triggered if we make the wrong terrain decision. 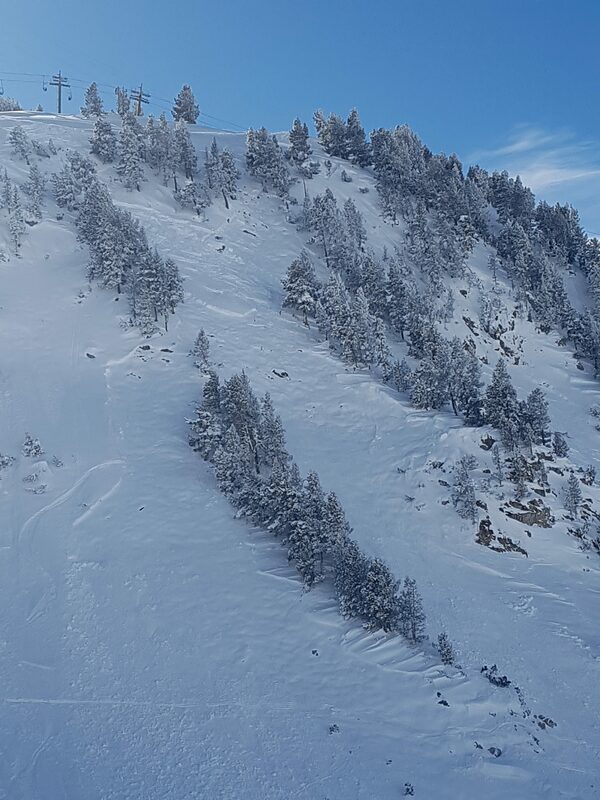 (…) With 50-60cm of fresh snow, wind providing some cohesion and considering the unfavorable base layer; several soft slabs have been created and are difficult to detect, especially in mid heights where the wind effects are not so visible. Such slabs will need favorable terrain for been triggered, but if triggered, they can take the snow up to the base layer. Avoid skiing big and steep terrain, convex slopes and be careful with terrain traps”. At some points of the slope we could see some purges, however the main sectors remained crazy clear and beautiful. Suddenly the two first riders of the day, in snowboard, drop right in the biggest, steepest and most exposed slope. They are not going all that fast, they don’t seem too convinced and they make a diagonal right in the middle of the apparently weakest point of the slab. I really had a cold sweat watching the situation. I thought that if there was one thing you shouldn’t do in that terrain, was exactly that. However, nothing happened. Zero consequences. The slab did not broke, no signs of purge, no fractures, no pressure marks, nothing. After the stress, comes the euphoria. All the riders on the chairlift cheering while the stunts were spraying all over the slope. Soon after more drop ins happened pretty much all over the sector and they all seem to work just finne. Mi friends and I after a moment of not been too convinced, we decided that the party is open. If the punkiest slab hasn’t popped, even on those circumstances and everything seems to hold on, then we gave for granted that it was safe. Well, we still decide to play it cautious, and we go for a secondary ride with smaller slope, less steepness, less commitment and without terrain traps. There was already two tracks on it and Julen and me decided to take it one by one. Everything went smooth and we had an awesome moment of happy riding. For the next round, we saw from the chairlift that tracks were now appearing everywhere, even on the steeper parts and still nothing had popped. Still we are not convinced for going steep so we decide to take a variant of our initial line, but slightly steeper. As soon as I get in the slab, I see a fracture rapidly expanding under my feet. A big chunk of the slope just went down. It was not critical, neither fast, neither had strength, wasn’t compact and did not generate too much pull. I stayed out of it without difficulty and it dissolved very fast due to the cold dry snow. We rapidly escaped the terrain and remained with a bitter taste. Even though the objective danger was not high, it was a disgusting reminder and we felt concerned of what just happened. We decided to change area as soon as possible. While we took a last look to the slope, we saw another rider breaking a mini slab under his feet. Unlike me, he goes with the slab, but been small and with such fresh snow, it dissolves fast and it almost didn’t even destabilized him. Ok. Double check. We are getting out of there. A few hours later we came back in front of the sector and that’s what we saw. 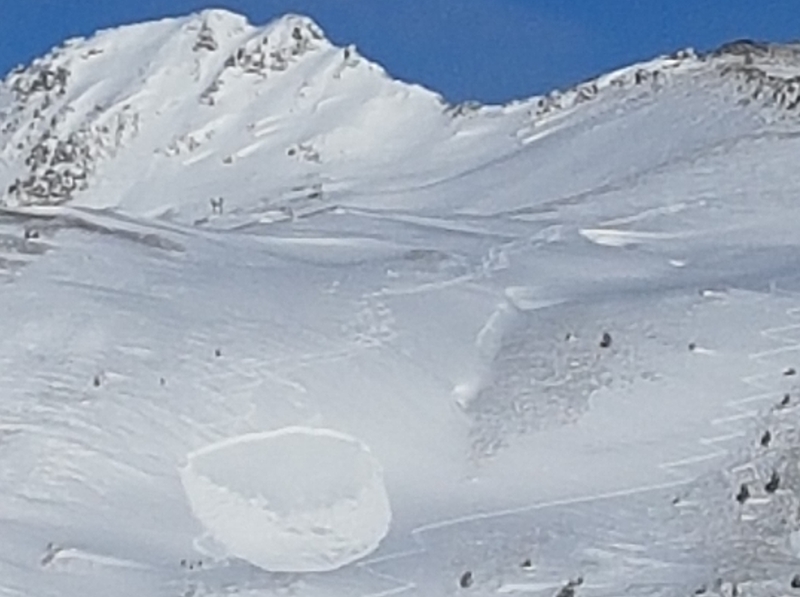 A large size avalanche triggered on the critical slab where the first snowboarders draw a diagonal. We can see that under the avalanche there are many tracks and the avalanche even swallowed the diagonal lines that many people decided to take just under the slab. Such avalanche puts you on a complicated scenario just with the snow transport, but on top of that, it’s gonna throw you straight against some very nasty terrain traps. It is not that obvious to get out of that situation without a nasty ending. ¿How many people were that day on the impact area? ¿How many we failed in our judgements because of the pow frenesi? 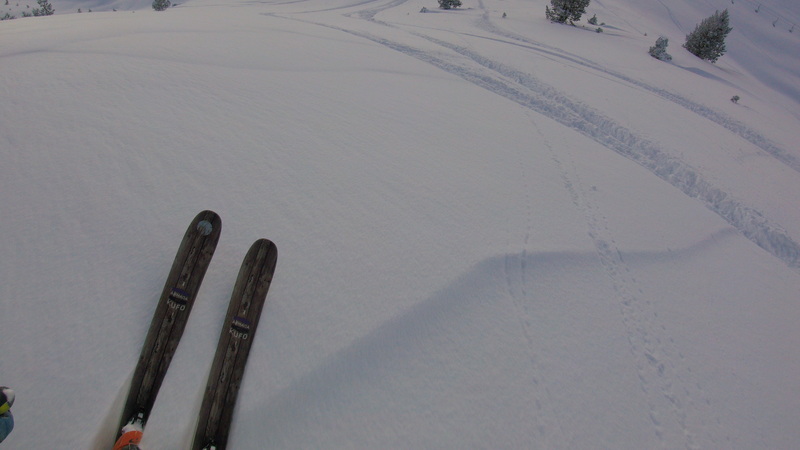 Just because that slope is a classic on powder days, just because you may have skied it before, and just because it has already been skied that day, it doesn’t mean you are safe. A bit later we went to the Peülla area. While entering the valley, we spotted two big avalanche scars. We stood there for a while studying it’s facings, snow transport, fracture points, wind marks and other relevant details that will help our further decision making. 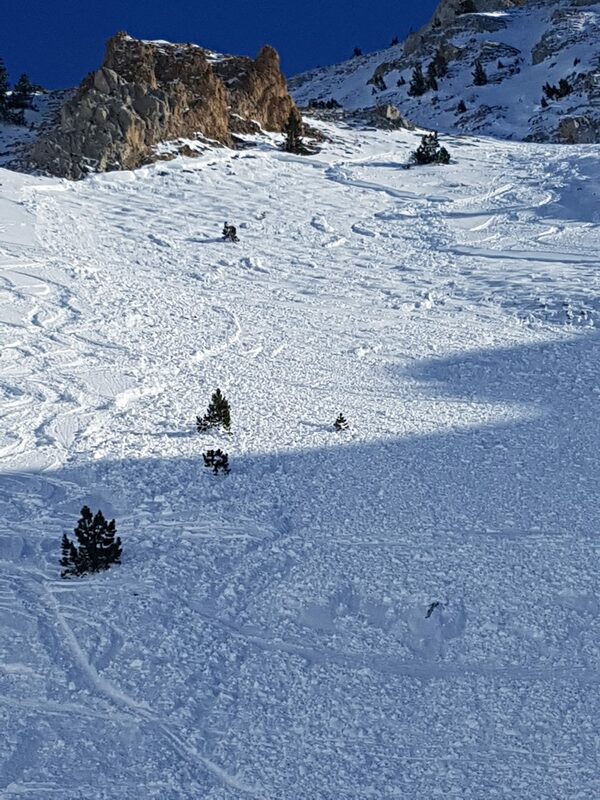 While we were still standing there, we spot three riders hitting one of the slopes with an avalanche scar, but coming from above. After several happy rides on another easier and lower exposure terrain, we decide to come back to the valley of Bonaigua. While we are exiting the valley I spot an elegant Z-turn line going all the way up a mountain with wide white slabs. They look solid, technical, efficient and overall well drawn. I feel respect for such activity because the day after such a heavy snowfall I’m not confident going touring in such big terrains. The avalanche slows down fast and it doesn’t seem to have a lot of strength. Still it leaves a big scar in the mountain. The three skiers achieve to just remain in front of it. With slightly more compact or wetter snow, this could have turn completely different, especially considering that all three were at the same time in the slab making self rescue maneuvers completely impossible. Here we can see another slope completely tracked down. It was already completely tracked down in the morning, but a few hours laters it had this big cut over it. My whole point here is that we must be careful and not give things for granted. We must be humble and ski what conditions allow to be skied on the day. It’s a well know fact that in the terrain that we know best is where we take bigger risks. This sunday confirmed that we cannot just have a standard riding route for “those days with pow”, because “those days with pow” will actually have a million different conditions behind them with very different potential consequences. I had already skied several times the slab that I broke that day, just as I’ve already skied a few times the line on the video and the one of the snowboarders. This is not about the bad guys and the good guys. Obviously the person on the video had experience and good reflexes. On such stress situation, he kept solid on the moving slab, exited without falling and pulled the airbag at the right time. Did he made mistakes? Yes, no doubt. The touring guys if they were able to draw this uphill line, they most have likely spend quite some time in the mountains. It seems easy to start the shitstorm on them for heading parallel to such bowl, but perhaps things were looking different from inside than from outside. I can just talk about myself. I have a proper avalanche course and I have done quite a few trainings with mountain guides over the past three years. Every year I force myself to practice the maneuvers, I read quite a lot on the topic and I have the chance to be pretty much everyday on the mountains in winter, so I can observe the terrain and its evolution according to conditions. Still, the more I learn and the more I train, the more danger I see everywhere, the more I realize how hard it is to have things under control in the mountains, and of course, I still make mistakes and do not always see things coming. Another big dump is forecasted for the end of the week. Keep in mind that big dumps at the beginning of the season are particularly traitorous. Jamie Pierre died in an avalanche on the first big snowfall of the season some years ago. More recently, this october actually, Hayden Kennedy and his girlfriend Inge Perkins got trapped in a big avalanche. Inge got killed and Hayden committed suicide the day after due to the emotional toll. Hayden Kennedy had actually two Piolets d’or and was one of the most recognised alpinists that we have seen lately. Even with all his experience and criteria, at the end we are all just small and fragile in the mountains. Ok, but what can we get out of this? I’m going to make a list of the best advice that I can give you for keeping safe in the mountains. Don’t learn through pain. Do not wait for that nasty situation before you realize that you need to learn and train. Don’t learn through a blogger. At my best I can motivate or give you some good advice. But keep clear that no one is going to be safer in the mountains just by reading these lines or any other blog. As Einstein once said, “the only source of knowledge is experience, the rest is information”. Go to professionals. Make an intensive avalanche course. They tend to last four days or a few weekends in a row. Learn about terrain reading, gear, group management, safety protocols and rescue. Period. There is no way around it. If you are not convinced yet, then just do it for not been left alone. It’s not fair to go to the mountains with trained people that maybe can save you, while you have no clue about how to help them in case of accident neither about giving a proper opinion in the decision making process of the group. It’s common to see people refusing to go to the mountains with untrained and ungeared folks and it’s completely legit. Go to professionals again. This is not riding a bike; you don’t learn it once and then you are good. In every course I’ve done I’ve learned powerful new skills and knowledge. Everything piles up and it’s very interesting to hear other professional opinions and experiences. Buy the goddam gear. Transceiver, probe and shovel should always go with you. Gear is completely worthless if you don’t know how to use it. I don’t mean only in theory; if you do not have fast reflexes and a proper trained protocol with your team, you most likely don’t really stand a chance. 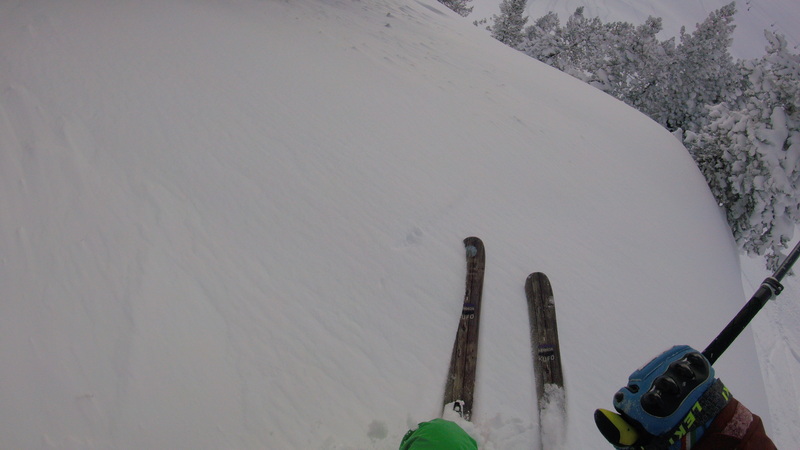 Recco pretty much only serves for recovering corpses and Airbag devices are a great tool for freeride. Transceiver, probe and shovel ALWAYS, and please make sure you have battery and extra batteries on the backpack. Mountains are faddy. Period. There are many magic lines out there that only have safe enough conditions once or twice a year or may not have conditions several years in a row. With our current lifestyle, it’s common the weekend warrior plan. Driving from the city to the mountains without having seen the terrain in two weeks and dropping in a king line as soon as the lifts open. That perhaps is not the best battle plan. Bias and self-justification. Several times we end up taking poor decisions in the mountains, but we don’t always suffer the consequences. This drives us into cognitive traps and we end up believing that we are very smart and skilled for making the right decisions in the mountains. For example, those snowboarders from the first slope, probably went home believing that they did played it very smart, just as all the other persons that tracked that slope or the ones that made the lower diagonals. If you normally roll in the same mountains, read everyday the snow and avalanche forecast submitted by your local agency. In the case of the Val d’Aran, that’s Lauegi. Even though you are on the city far from the mountains, it will keep you updated on the evolution of conditions and you will get good keys in what to look for and how to do it. Again, don’t learn through pain or through a blogger. head to professionals and buy the goddam gear! Last but not least, be humble and happy riding. 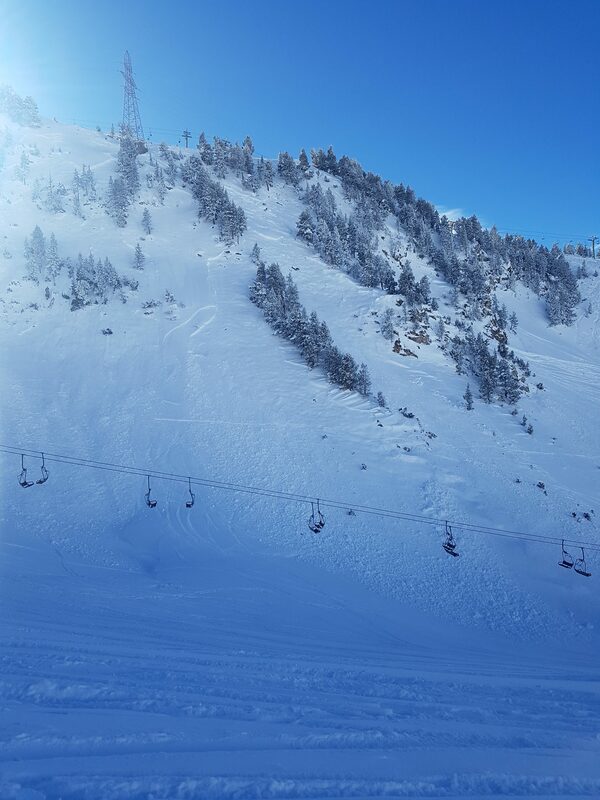 This entry was posted in Progressing and tagged MountainSki. Bookmark the permalink. ← First expedition of the season. Exploring Marimanha.